The ballot box at the Albany Public Library on Wednesday. Colorado has adopted vote-by-mail balloting of the kind pioneered in Oregon. Now a video circulating online intends to raise suspicions of voter fraud in Colorado and, by implication, other states where voting is done mostly by mail. But all the video shows is that some left-leaning activists in Colorado were dumb, naive or crooked enough to be interested in trying to exploit the new system in nefarious ways, not that it could actually happen, let alone that it was taking place. The video was made by James O’Keefe, the activist who poses as someone else and, with a hidden camera, tries to induce people to implicate themselves. On his latest product, at least a couple of campaign volunteers or workers for Colorado Democrats appear to be interested when O’Keefe offers to collect discarded ballots and cast them fraudulently. The same sort of thing — collecting ballots of citizens who threw them away — has been wondered about in Oregon. But how could that possibly work? So where’s the fraud possibility in casting discarded ballots? 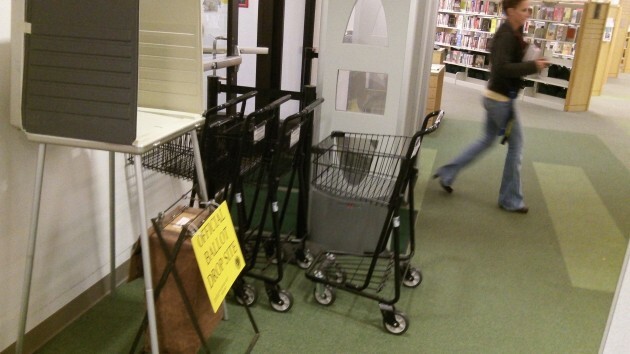 On a related front, a reader of hh-today questioned ballot security because at the Albany Public Library’s main branch on 14th Avenue, a ballot drop box sits unguarded by the front door. The staff says a county worker comes by every few days and empties it, though during presidential elections, when more ballots are cast, pickups happen daily. The box can be seen from the library’s front desk, but it is not closely watched. Is that a chink in the armor of the voting system? I can’t see how. Yes, a strong-arm robber could grab the bag and make a break for it, out the door. But how would he know who would benefit from such a heist, the crooks paying him or their opponents? As Linn County’s Steve Druckenmiller and other Oregon election officials have said many times, the possbility of fraud or error is much less with voting by mail than with casting ballots at polling places. Mail ballots are inspected, and the names of voters who cast them are checked off as ballots come in either in the mail or from drop boxes. Another ballot comes in with the same name, the system knows right away something is wrong. When ballots are returned as undeliverable, after some checking the voters’ names are scratched from the rolls: No more possibility of dead people voting. The article describes an encounter between a “ballot stuffer” and a Republican Party official. The article also explains how some of this fraud occurs, if it does. I do not see how what is shown in this video could work in Oregon, given our voting laws that seem to have a pretty tightly controlled process. However, the laws in other states, or their procedures may not be the same as here, and may allow room for the methods described. I have never understood how proving one’s citizenship to register to vote is”disenfranchising” to anyone. Liberals often claim that some people who want to and are able to vote, somehow lack the wherewithal to prove their citizenship to register. I find that argument specious at best. The far greater harm would occur if ILLEGAL ALIENS are somehow able to work the system and cast ballots in our elections. That is totally unacceptable and the far greater threat to our constitutional republic. Ballot fraud is just about impossible? Well, in our one-party state your assertion may be more true than false. But if the political culture gets more diverse and contentious, the risk of bad behavior will increase. And I’ve never been comfortable with vote-by-mail’s signature verification process. Election workers are not handwriting experts. The process is inherently error prone. When ballots are rejected for having a signature that doesn’t “match” the voter is effectively disenfranchised, i.e., the voter is deemed guilty before proven innocent. My scrawl has changed over the years. And if my cell phone is off at verification time, I need to trust that the clerk will still count my ballot. The library ballot bag is a joke in terms of security. If James O’Keefe came to the library and video taped how easy it would be to steal the ballots, the city and county clerk would have some explaining to do. The question isn’t “who would benefit by the theft?” The question is, “is the process trustworthy?” Your photo reinforces a conclusion that the integrity of the process is highly suspect. Do I want to go back to polling places? No. I like the convenience of VBM. But here in Albany embarrassing things happen all the time to local government. It’s just a matter of time given the current process in place. Your question reminds me of the situation where a fraudster leaves fingerprints on his own death certificate. What motivates a person to act so stupidly? I dunno. People kill to steal a buck. Taking a bag of ballots doesn’t seem that crazy in comparison. There are so few instances of documented voter fraud in the United States that’s it’s one thing we can be VERY proud of. Whether at the polls or by mail there have always been check built into the systems to try to prevent fraud. Nevertheless, some states seem to be hell bent on making it harder for people to vote. If it’s not because of real fraud, is it merely attempts at voter suppression for political reasons? Maybe that’s the true voter fraud these days. Hotels require ID’s for their business purposes There’s no law requiring us to show one. It’s your choice. Here are two from the Washington Post. Where is the problem? I seem to remember you wrote about the absurdity of the DMV against an 80+ woman in Scio/Lebanon (?) or someplace who couldn’t get a license renewed because she had no birth certificate, even though she had a license for many years. I used to be a voter registrar. If a person came before me and swore they were a citizen and gave their address, they got registered – that was the law. Then they voted if they wanted to.I guess today we are far more cynical about or fellow residents. And as the above links show, no one seems able to document that there is a problem with voter fraud. Where is the real evidence and statistics to show a problem really exists. Anecdotes do not make good law. For what it’s worth, voting is a constitutionally guaranteed right of U.S. citizens, Similarly, the 2nd Amendment enjoys that same status. For years, photo ID (and more) is required to purchase a firearm from a licensed dealer. Why should one have to show photo ID to exercise one right, but not another? Again, the liberal agenda lacks consistency. As for me, I have no problem with showing my ID for either purpose and am consistent in my view. You are not. 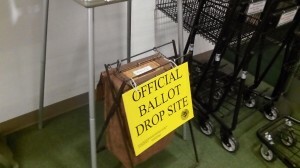 Here is an article describing one incident of stealing ballots in San Francisco. What motivated this person? Again, I dunno. But this stuff happens. The challenge is to create a process that reduces the probability of stupid behavior. Placing an unsecured ballot bag at the front door of the library and emptying it every couple of days invites stupid behavior. We can do better. We did have a case of attempted fraud by an election worker up in PDX the last election (or 2?) ago. She was filling in ballots that were unmarked for one of the races or referendums.